An elusive church, difficult to pin down, difficult to find and difficult of access. For a start, St Nicholas isn't a parish church at all. 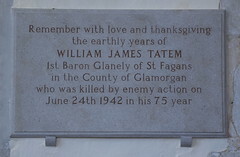 It sits beside the remains of Landwade Hall, which was partly destroyed by a German bomb during the Second World War. Pevsner isn't very kind about the bit that was left, but it looks lovely to me. 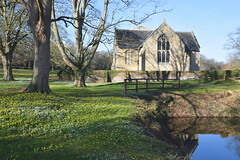 The Landwade Hall estate was part of the parish of Fordham in Cambridgeshire, but the church had long been a chapel of ease for the parish of Exning in Suffolk. 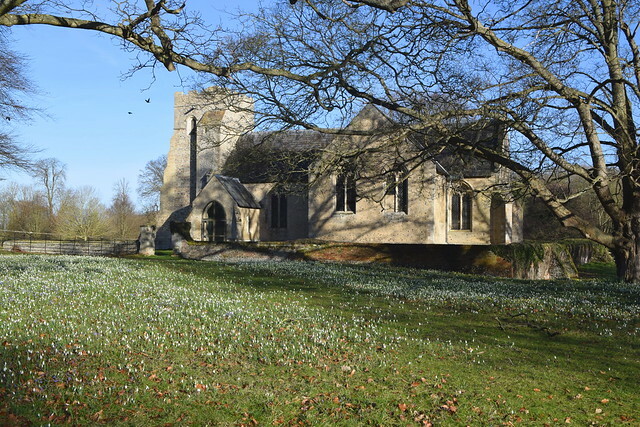 Exning and the part of Newmarket north of the town centre were an island of Suffolk within the county of Cambridgeshire until as recently as 1895, when the Cambridgeshire parish of Newmarket All Saints was moved into Suffolk to join the two bits together. One of the options at the time of the revision of English Counties in 1974 was to move Newmarket and Exning completely into Cambridgeshire. However, this was voted down in a local referendum, and Newmarket and Exning remain semi-detached parts of Suffolk. The corridor connecting them is only a hundred yards wide. A further attempt to tidy up the border between the two counties came in 1994. The changes affected a number of parishes, but the amount of land changing hands in each case was actually very small. In total, two people were moved from Suffolk into Cambridgeshire, and ten people came the other way. These were all living in the former grounds of Landwade Hall, and with them came their church. One of the curiosities here is that you can sense the border, new as it is. Landwade Hall is secret and wooded, you can hear the call of pheasants and the impatient whinny of horses in the adjacent paddock. Back on the road, you cross the railway bridge into Cambridgeshire and are immediately confronted with the vast Turners distribution warehouses, and beyond them the nightmarish A11 and A14. No county in the British Isles has been affected so much by human habitation as Cambridgeshire. 92% of the land area is under buildings, industry or farming. Of the remaining 8%, hardly any of it is covered by trees, since Cambridgeshire is also the least wooded county in Britain. Even Greater Manchester and the West Midlands have more wild areas. Cambridgeshire is even less wooded now that it has lost Landwade. The lane through the woods up to the cottages is not sign-posted, apart from one reminding Turners' drivers that it wouldn't be a terribly good idea to go up there, and when you get up to the cottages the driveway to the Hall is also not signposted. From this point you are on a private road without a public right of way. There is, however, a public footpath which runs up to the church from the road. This leaves the main road about 100m further north of the lane to the cottages. Beside it is the former gatehouse, but I am told that the gate there is quite often locked. Reaching the Hall is like stepping out of time. 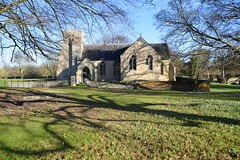 The church sits behind the Hall, you are on private land, and at this point it is worth saying that St Nicholas church is in private ownership. 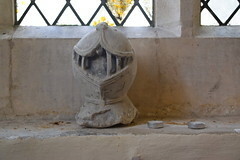 This is an unusual state of affairs, but not unique - in Suffolk the same is true of the Estate churches at Ickworth and Hengrave. For centuries, Landwade Hall was the home of the Cotton family, and that is why you will want to come here, for the church is also their mausoleum. The exterior of the church is not particularly pretty, since it has been cemented over, but it is interesting as an example of a small church that was all built in one go. 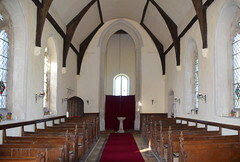 It dates from the mid-15th century, but is not ennobled with a clerestory and nave aisles like its contemporary at Denston. 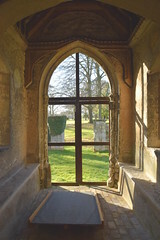 The window tracery is Perpendicular, but that is about it. The church is kept locked, but if you can gain access you step into an open, light, aisleless space. 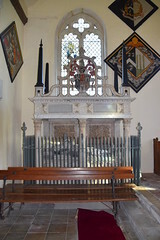 A small image niche is set beside the opposite door. 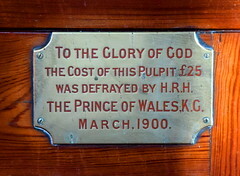 There are some 15th century benches which must have been installed when the church was built. 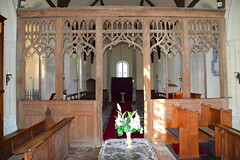 The rood screen retains its rood beam, and rises full length to it. However, it is hard to see where a rood loft might have been, and there is no surviving evidence of a stairway up to it. 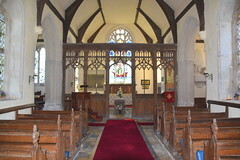 Indeed, because there are two chancel aisles, it is strung between two pillars. 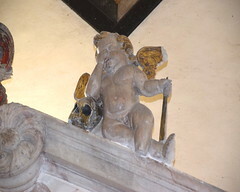 Further, there is very little clearance space between the rood beam and the ceiling. 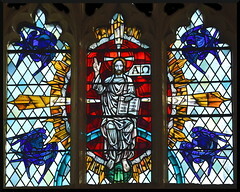 The nave windows contain a sequence of heraldic shields commemorating the various marriages of the Cottons. 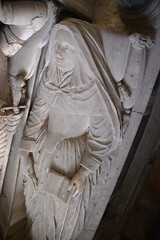 Several also have good 15th century figures in them, and there are more in the chancel aisles. 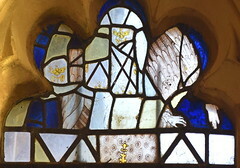 None are complete, and there must once have been more, but they are rather striking in their surroundings of clear glass. 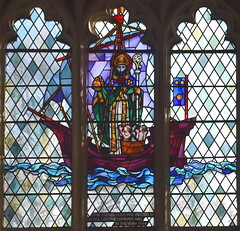 The only modern glass is Francis Spear's east window, a 1966 depiction of St Nicholas calming the waters from a boat, with a barrel full of children at his feet. 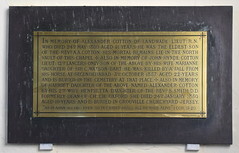 All this provides the setting for the Cotton memorials, some of the best in Suffolk. 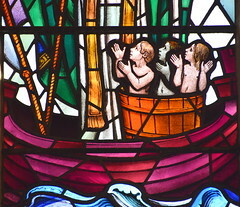 They are in the chancel and in the chancel aisles. 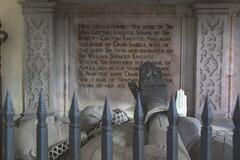 In the south aisle is the biggest, to Sir John Cotton, who died 1620. 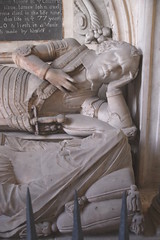 His inscription reads: Here lyeth the bodye of Sir John Cotton knight the son and heire of Sir John Cotton he married three wives the first Elizabeth daughter to Sir Thomas Carrell esq of Warneham in Sussex, the second Elizabeth daughter to Sir Humfrey Bradburne knight of Bradburne in the county of Darby, by whome he had noe issue, the third was Anne daughter to Sir Richard Haughton Baronet of Haughton Towre in the county of Lancaster by whom he had issue, James, John and Katherine, which James and Katherine died in the life time of there father, he departed this life in the 77th year of his age Anno Domini 1620 and lieth in a vault in the south ile of this church made by himself. 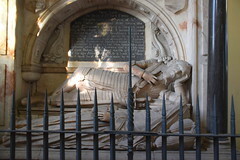 Sir John lies in front of it with one of his wives, presumably Anne. 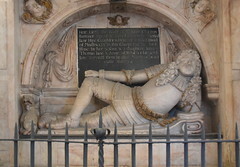 The monument is surrounded by its original iron railings, as is the one to its right to Sir John Cotton of 1689, presumably the son of the first Sir John, given that he must have been quite old by the time he married his third wife. Given that the two monuments are from either side of the Commonwealth, they are surprisingly similar. 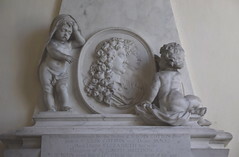 A third Sir John, who died in 1712, is quite different, being very white and classical. 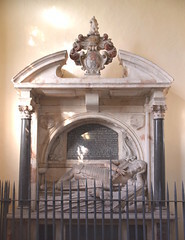 In the north aisle, there is a grand six-poster memorial to a still earlier Sir John, who died in 1593. 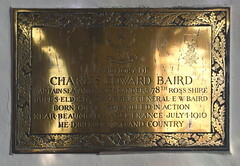 There are other memorials here too, but like those in the chancel they have mostly lost their inscriptions. 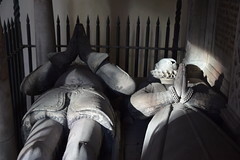 The most striking chancel memorial is the long altar tomb endways on to the east, as at Burgate. You have to keep your wits about you so that you don't fall over it. 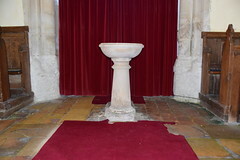 There is also a brass inscription in the chancel, in the south east corner to another Cotton, this one for a change called William. 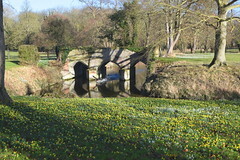 Perhaps most memorable for me on this beautiful sunny day in February 2018 was the vast sea of snowdrops and aconites sprawling across the grounds of Landwade Hall, probably the most spectacular display of them that I have ever seen.